Notice that this is the bare minimum number of physical steps to achieve what you’d want and you never need to take the iPhone out of your pocket. Pretty great. I’m not sure how many new cars have built-in bluetooth audio but my wife’s 2009 doesn’t. My beloved 2002 RSX doesn’t even have an audio line-in so I needed something extra. It took me three tries until I found a solution that worked well for me and it wasn’t easy to find reviews online that covered the things I cared about. I hope these review notes prove useful to anyone interested. The GoGroove is a fairly well recommended device that plugs into your cigarette lighter (do the kids still know that’s what they were once for?). 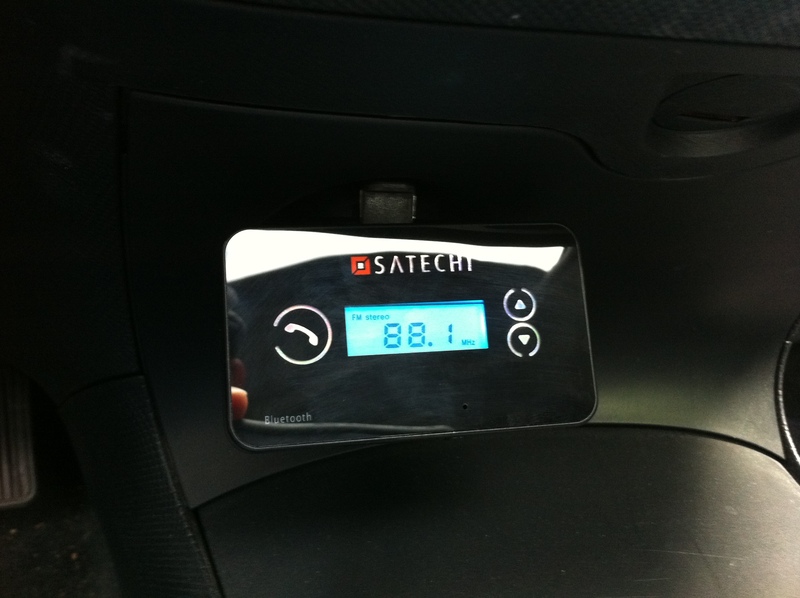 It uses an FM radio signal to pipe the audio to your car stereo that it fetches via Bluetooth. It’s long and kinda ugly but some might like how the pliable stalk allows it to come right up to where you’re used to reaching. I’d much prefer it to be smaller and less conspicuous. 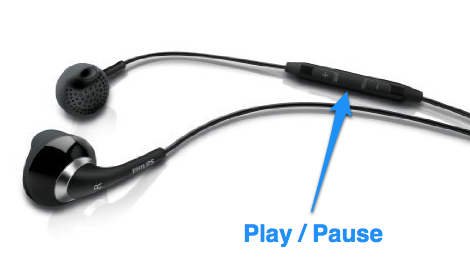 The main pros for it are that you can play/pause directly from the GoGroove and the reception is decent (but not great — most likely true for any FM-based bluetooth solution). Unfortunately mine simply stopped working after about a week (YMMV) so I returned it and decided to try something else. 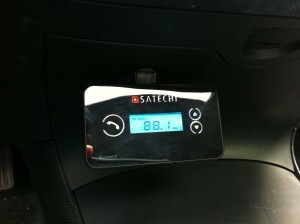 I tried the Satechi next which is a similar device but much smaller and sleeker. Unfortunately the reception was noticeably worse than the GoGroove and it required daily physical adjustment to get the audio quality to be bearable. 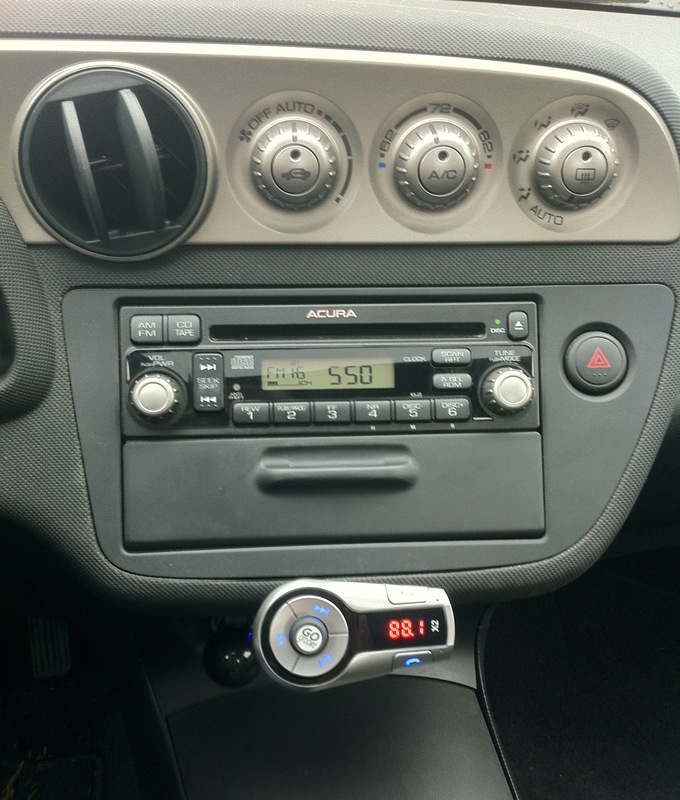 Also, it doesn’t have the ability to play/pause the audio directly from the device so you’ll need to fiddle with your phone after starting the car. Both of these flaws are deal breakers. 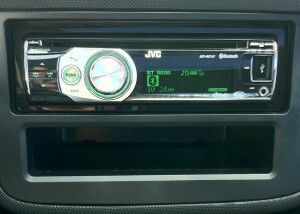 The benefits were massive: no more FM radio signal — the audio quality is amazing. Also, playback can be initiated from the dash so I achieved the ideal listing workflow mentioned at the top. Once you turn on the car it takes about 5-10 seconds to pair with the iPhone and then you’re good to go (there is an on-screen indicator when it’s ready). Also nice is that the unit has something like 30 different light colors so you can match your interior dash lighting pretty accurately. The only big con is that there’s no (obvious) way of pausing playback and it’s a little strange that you’re to press “menu” to start the audio playback. But these both aren’t really that noticeable in practice. 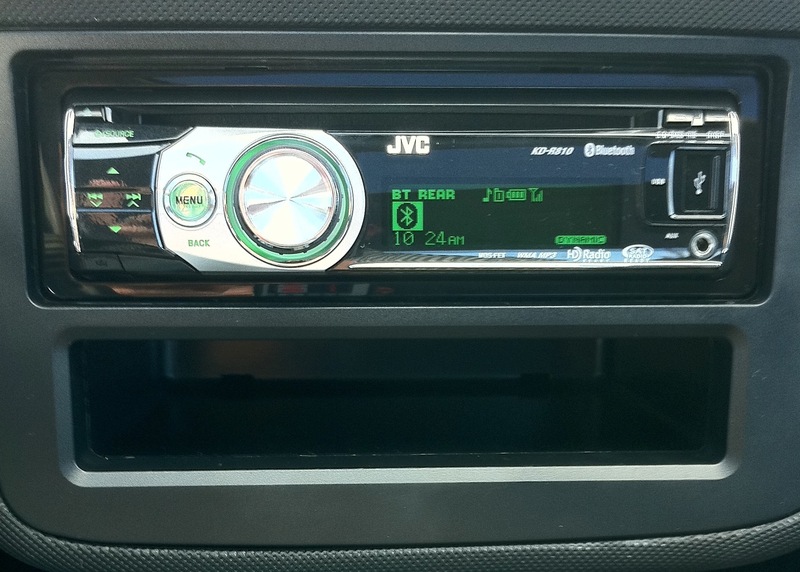 Overall I’m very pleased with the JVC and would recommend it. I was eager to use Instacast, an alternative to the iPhone’s “Music” app, mainly to take advantage of its ability to fetch new podcast episodes while I’m out and about. The app is cool but unfortunately due to the way the iPhone manages memory, I couldn’t achieve my optimal listening workflows mentioned at the top. At the end of the workday I would get in my car to go home, press play and start listening to an entirely different podcast — the one queued up in the Music app. It turns out that after some time using the phone for other activities, iOS would kill the Instacast app so that starting up the audio initiates the default Music app (which I guess never gets terminated by the OS). This was annoying enough that I’ve gone back to using Music and dealing with iTunes again (which thankfully is mostly automatic since the advent of wireless syncing). It’s worth noting that you can invoke Siri on an iPhone 4S by initiating a voice dial through the JVC with a couple of button clicks. Then you can try to say anything (like “Play The Talk Show”) which is pretty neat — when it works. I guess the voice audio quality of the JVC hands-free system isn’t good enough for Siri to always, or even usually, just work. Update 3/21/2013: Siri has drastically improved since I wrote this post. I rarely need to ask for a podcast or album more than once. Posted on March 6th, 2012 and filed under technology.